Leaving the EU's single market as part of any Brexit deal would do "untold damage" to the UK economy, Nick Clegg has told the Lib Dem conference. The former deputy prime minister, who is now the party's EU spokesman, said the single market was a UK creation that was vital for jobs and prosperity. The Tories, he said, were "up a Brexit creek without a paddle, a canoe or a map - they have absolutely no clue". The government has insisted it will secure a "positive outcome" on trade. However, former Lib Dem business secretary Vince Cable said the party "must accept" the referendum result and stop focusing on a second vote. The UK voted to end its EU membership by 51.9% to 48.1% in a referendum on 23 June. The timing of the process for exit has so far been clouded by uncertainty, with no clear signal from Mrs May's government on when it would begin - other than it will not start this year. There is also confusion over the nature of the UK's future relationship with the EU, especially whether it intends to remain a member of the single market, which offers free movement of goods, finance and people around the EU without any tariffs, quotas or taxes. In a speech to party members in Brighton, Mr Clegg said he feared that under pressure from "swivel-eyed" Conservative backbenchers and the Eurosceptic press, Prime Minister Theresa May would be forced into pursuing a so-called "hard Brexit" - leading to "gridlock" in negotiations with the rest of the EU. Continued membership of the single market must be a red line in the UK's talks with the other 27 members, he said. He said: "It is entirely possible to be in the single market but out of the EU, as Norway has shown. While it is undoubtedly an inferior option compared to full EU membership, it is the only option that would safeguard jobs and prosperity. " The alternative, Mr Clegg added, is "many years of chaos" for key export industries such as cars, financial services and food and drink. We won't get a deal from outside the single market which comes anything close to the privileges we have as a member - that is the unavoidable truth that the Tories won't tell you." 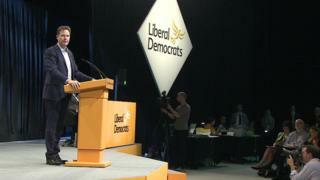 To widespread applause from Lib Dem activists, Mr Clegg said the Conservatives would never again be able to claim the mantle of being the party of business or be regarded as a responsible party of government if they damaged the economy in the process. Lib Dem party members endorsed a proposal for a referendum on the terms of the final Brexit deal negotiated by the government, with the option of remaining in the EU. Leader Tim Farron has made calls for another referendum a key part of the Lib Dems' pitch, and a central theme of its conference, while insisting he respects the Brexit result. But Mr Cable, who lost his seat at the 2015 general election, has said holding a second vote "raises a lot of fundamental problems". Mr Cable, who voted against the motion, told a fringe meeting he understood the anger at the outcome of the Brexit vote but it was wrong to think it could be reversed. "The public have voted and I do think it's seriously disrespectful and politically utterly counterproductive to say 'sorry guys, you've got it wrong, we're going to try again'. "I don't think we can do that. That's a personal view, and a lot of people won't share that view." Mr Cable said he was "not criticising" Mr Farron, but rather he wanted to "see more emphasis on what it is we want from these negotiations rather than arguing about the tactics and the means". Mrs May has insisted "Brexit means Brexit" but she has refused to give a "running commentary" on the government's Brexit negotiating strategy, saying it would be an error to "reveal our hand prematurely". She has said, however, that the government is determined to secure the "right deal" for Britain, that includes a "good deal" in trading goods and services, as well as controls on immigration. Former education secretary Nicky Morgan, who was sacked in Mrs May's reshuffle, said on Sunday was time for the government to "flesh out" some of the details on its plans. "You are seeing today that there are people in the Conservative parliamentary party now saying they are going to set up a sort of hard Brexit group. "If you leave a vacuum other people will fill it and therefore I think the time is now to say - 'this is what we would like to get out of Brexit'," she told ITV's Peston on Sunday.